In our first two mocks, we went with the basic assumption that the Patriots would keep all 12 of their draft picks. But we all know, they’re not going to do that. So we’ll go with a commonly believed scenario that they try to trade up to get a playmaker that they sorely need. Round 1, Pick 21 – Noah Fant, TE, Iowa: Fant was still around on the board and he may not have lasted until #32. T.J. Hockenson, the most complete tight end in the draft was taken at #12 by the Packers in this mock. Fant is a very athletic 6’4, 249 tight end from Iowa who excels open spaces. His yards after contact and ability to stretch the seams will immediately make him a very coveted receiver in the offense. He is a versatile player that can be moved around the formation outside, in the slot or as an H-back. Despite playing in a run-heavy Iowa offense, scored 18 touchdowns in his last two seasons. A standout basketball player, Fant has excellent jumping ability and agility (6.81 3-Cone Drill). He needs to get bigger and stronger to become a better blocker in the running game but with Austin Seferian-Jenkins on the other side, he’ll have time to develop in that area. However, as a receiving threat, he should be an immediate impact player. Round 2, Pick 56 – J.J. Arcega-Whiteside, WR, Stanford: Arcega-Whiteside comes from an athletic family. He was born in Spain and both of his parents were basketball players. He brings very good size, 6’2, 225 to the WR position. He’s got a quick release off the line, very good hands and a large catch radius. He had excellent production in 2018 with 63 catches, for 1059 yards (16.8-yard average) with 14 touchdowns. He posts up like a basketball forward in the red zone and is a very good target there, (28 TDs in three seasons). He has good but not blinding speed at 4.48 but he’s best utilized in the possession game. He can move the sticks and gets better the closer the team gets to the red zone. He’s gotten better every year and should be a very nice pro receiver who can occasionally stretch the field. Round 2, Pick 64 – Christian Miller, Edge, Alabama: Miller was just a one-year starter but nevertheless had a very productive final season for the Tide. He made 36 tackles with 11.5 tackles for loss and 8.5 sacks. He tips the scale at 6’3, 247 and is a very athletic edge player. He has the long arms and above-average athleticism that coaches look for in edge players. He’s versatile and has a quick step off the snap either standing or with his hand on the ground. He has above average pursuit and can drop into coverage and cover backs in the flat. He’ll need to get stronger at the NFL level to be a three-down edge player but he should immediately see snaps as a sub-package edge rusher with the Patriots defense. Round 3, Pick 97 – Bobby Evans, T, Oklahoma: Another surprise to still see him on the board at #97, Evans was a three-year starter for the Sooners, two at RT and then at LT in his final season. Evans plays with a bit of a mean, nasty streak and should immediately reap the benefits of playing for Dante Scarnecchia. He’s considered a bit short at 6’4 for the position but has long arms and can solidly punch the chest of pass rushers to fend them off. While not considered overly athletic, he has the agility to get outside and pull on running plays. He has excellent core strength and is very tough and will immediately vie for the swing tackle position with the ability to become a starter in short order. Round 3, Pick 101 – Will Grier, QB, West Virginia: Grier is a developmental QB prospect for the Patriots offense. While he has marginal size, (6’2, 217, similar to Jimmy Garoppolo), and arm strength, he has a kind of “it factor” where he can galvanize the rest of his team. See the Oklahoma and Texas games where he led late comebacks. Had very good numbers in 2018, 266-397 (67.0%), for 3864 yards with 37 TDs and 8 INTs in 11 games. He’s very accurate in the short-to-intermediate areas of the field. He reads defenses well and is a good leader in the huddle and the locker room. His mechanics can improve but he has a good body of work to work off of. He’ll immediately step into the #3 position and vie for the backup job in Year 1. Round 4, Pick 124 – Kaden Smith, TE, Stanford: Smith is a big 6’5, 255 “Y” tight end from “Tight End U” who is good as an in-line blocker, played in a pro-style offense and can serve as a safety blanket underneath. Smith will be able to step in and contribute in the running game right away as his blocking is good but will improve over time with improved technique and a bit more core strength. He has a wide catch radius with very good hands, but won’t be a threat to attack the seams. He’s more of a short, safety valve, ball control guy with the upside to improve. Round 7, Pick 239 – Renell Wren, DL, Arizona State: Wren is an intriguing prospect with good size, 6’5, 318. In college, they played him over the nose but he may be a better fit as a pure defensive tackle. He possesses freaky athleticism for a big man but he’s a project and may require a lot of work with Joe Kim who helped Patriots DL work on their hand usage. Has a lot of upside but may take a year or two to blossom. Round 7, Pick 243 – Kendall Joseph, LB, Clemson: Joseph is an undersized but productive inside linebacker who may have benefitted from playing in a loaded defensive front seven. He’s just 6’0, 233 but had 84 tackles, five TFL, and four sacks during the Tigers National Championship run. He does have good instincts and showed good coverage, but he may have to carve out a role on STs to make the roster in 2019. Round 7, Pick 246 – Penny Hart, WR, Georgia State: Hart is a small, very small (5’8, 180) wide receiver who had excellent production at a lower level of competition. But got an invite to the Senior Bowl and looked uncoverable. He’s a very twitchy slot receiver who can return punts and kickoffs. Round 7, Pick 252 – Saquon Hampton, S, Rutgers: Hampton is our requisite Rutgers pick as the Patriots address the safety position late in the game. He’s a natural leader and a team captain, something the Patriots look for, with good size at 6’1, 206. Said during an interview, he tries to emulate Patriots safety Devin McCourty. Sold. Welcome to New England. This entry was posted in 2019 Patriots offseason, NFL Commentary, Patriots Commentary, Patriots Rumors, Patriots Twitter and tagged 2019 NFL Draft, 2019 NFL off season, 2019 Patriots offseason, Bill Belichick, Bobby Evans, Christian Miller, JJ Arcega-Whiteside, Kaden Smith, Kendall Joseph, New England Patriots, Noah Fant, Penny Hart, Renell Wren, Saquon Hampton, Will Grier on April 15, 2019 by Steve Balestrieri. As we count down the days until the 2019 NFL Draft is upon us, we’re going to look at some of the positions that the Patriots need to address to restock, reload and prepare to defend their Super Bowl title. As everyone knows, winning back-to-back titles is extremely hard. So, with that in mind, let’s take a look at several positions that the team needs to address. And we’ll start with tight end. Dwayne Allen was released and Rob Gronkowski now finally deciding to retire, the Patriots are in dire need of a productive tight end. Regardless of whether he came back or not, the tight end position needs a shot of youth there. With Gronkowski gone, the position consists of Jacob Hollister, Ryan Izzo, Stephen Anderson, and the newly signed Matt Lacosse. Lacosse will be an upgrade in the passing game but isn’t the blocker that Allen is. Hollister is a talented kid but can’t stay healthy. Izzo is a very good blocker while Anderson is the wildcard. In the upcoming draft, we expect both T.J. Hockenson and Noah Fant to be gone before the Patriots pick, despite our recent Mock Draft 1.0 where Hockenson was still there when we selected. So, who do they have a shot at? Could they now move up and take one of those players if they are still around in the #15-20 range? Yes, I’d think Hockenson may be that target. Smith is a slightly small TE at 6’2, 242, but had excellent production in 2018 with 710 yards, 16.1 yards per reception and seven touchdowns. He doesn’t have a ton of experience but he’s just scratching the surface of his potential. What his Role Will Be: Smith will be eased into the offense as a flex or “move” tight end initially or line up in the slot with two tight end sets. Will his Role Change from Year 1-2? Yes, with added strength and size, he could be ready to become a true three-down TE inline. Smith could be the eventual “replacement” for Gronkowski, and we put that in quotes because no one can replace Gronk. Irv Smith could possibly be around at the end of the 1st round for the Patriots. He has the potential to be a very good pro receiver. He comes from an NFL background and is just scratching the surface of his professional potential. From our point of view, he’d be enjoy big production in this offense. Could the Patriots move up to get him in Round 1? It is now more than just an exercise in what-ifs. Smith is a well-rounded, tough, customer. He’s the latest member of “Tight End U” to enter the NFL Draft. Smith (#2) has improved his run blocking by working with Stanford alums Zach Ertz and Dalton Schultz. What his Role Will Be: Smith can be eased into the Gronkowski “Y” tight end role gradually, especially if they swing a deal for an established veteran. Will his Role Change from Year 1-2? With improved route running and strength after a year in the conditioning program, he could become a productive #1 or #2 tight end. The Patriots should find Smith on the board during Day2/3. He isn’t the most athletic tight end but will be a solid blocker and should be fine working underneath moving the chains. While probably not ever becoming a dynamic receiver in the Gronkowski mold, he could be a very solid, move the chains type of guy. Sternberger is a talented pass catcher who comes from a very athletic family. His mom was a HOF basketball player from Southeast Oklahoma St. and his dad played football at Southeast Oklahoma. He’s 6’4, 252 pounds and had 48 catches, 832 yards and 10 touchdowns for A&M this year. What his Role Will Be: Sternberger could easily slide into a move TE role initially and give the Patriots a big target out of the slot. Will his Role Change from Year 1-2? If he can improve his strength, he could possibly get more snaps at the “Y” position. 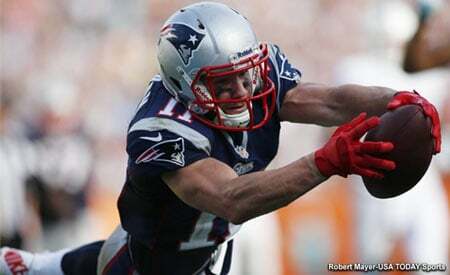 He can eventually replace a lot of Gronkowski’s production, when he gets cut loose more in the passing game. He’s a very good athlete at the position and should give the team flexibility to be the move or the “Y” tight end. What is his ST Value? He could find himself on the return teams right off the bat. Sternberger could be found in the middle rounds and one AFC scout told NFL.com that he can easily become a 50-60 catch kind of player. Sternberger has a lot of upside with star potential as a receiver. I look for him as a Round 3 or 4 selection. If he’s there, he’d be hard-pressed to pass up. Wesco has very good athleticism for a big man 6’3, 270. He’s part offensive lineman, part pass receiver who can block, run and catch the ball. He’s still very raw in the pass receiving department but could become a very good #2 tight end. Will his Role Change from Year 1-2? If he can improve his skills in the pass-catching role, he can become a much more viable target in the passing game. He can replace Dwayne Allen’s role as a big, physical blocking tight end who can catch the occasional pass thrown his way. What is his ST Value? He will immediately play on the return team as an athletic big man who can open holes for the returners. Wesco is a player who will be there in the late rounds and has the capability to be a very good #2 tight end. If Gronkowski does indeed return for more one go-round with the Patriots, picking up a guy as Wesco sets them up for the #2 spot for some years ahead. But it is doubtful, he’d ever become a #1 guy. 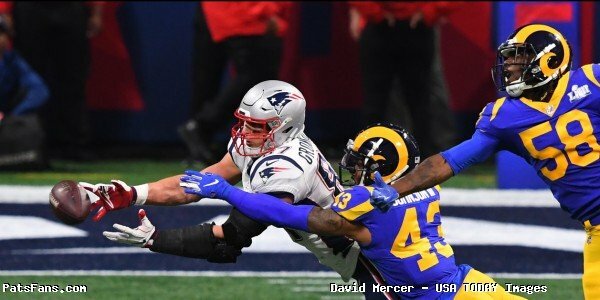 The Patriots need to address the tight end position in the draft or possibly decide to make a trade with one of their 12 draft picks for an established veteran. Reportedly, via Mike Reiss at ESPN, they were actively trying to bring Jared Cook in but he balked at the thought of Gronkowski returning and the two having to split reps. However, Cook hasn’t signed anything yet so he may get an 11th hour push from the Pats. In regards to the draft, while there are other tight ends that may fit the Patriots offense, these are the ones we feel would be the best fit. We’ll continue to keep an eye on any developments as they unfold at Gillette. Listen to ourPatriots 4th and 2 podcasts on blog talk radio as Russ Goldman, Derek Havens and myself fromPatsFans.com discuss the latest Patriots news and game analysis. 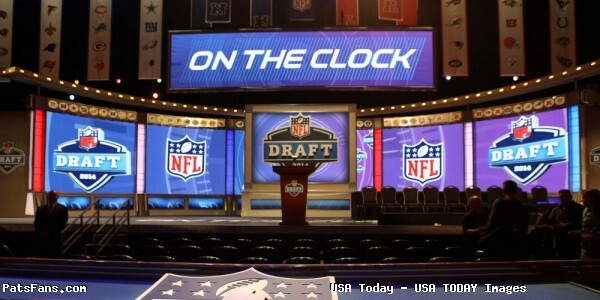 This entry was posted in 2019 Patriots offseason, NFL Commentary, NFL News, Patriots Commentary, Patriots News, Patriots Rumors, Super Bowl LIII and tagged 2019 NFL Draft, Irv Smith, Jace Sternberger, Jacob Hollister, Kaden Smith, New England Patriots, Noah Fant, Patriots 2019 Mock Draft, Patriots 2019 offseason, Rob Gronkowski, Ryan Izzo, Stephen Anderson, T.J. Hockenson, tight end depth, Trevon Wesco on March 25, 2019 by Steve Balestrieri.